"Museo dei dolmen" (Dolmen Museum) is a virtual museum of Mediterranean and Western Europe prehistory and early history, set up and directed by Federico Bardanzellu. family burial of the dominant clan. Inside the route, some locations may have a very special religious significance, such as Luras (four structures), the area around Buddusò (eleven), around Berchidda (thirteen) and the Corsican site Sartene-Filitosa. The route starts from Macomer (NU), a town in the central-northern Sardinia, which can be reached from Cagliari, taking SS131/Cagliari-Sassari (Carlo Felice) until km 132, exit Borore / Macomer, and follow signs for 7 miles. Even coming from Sassari, take SS 131 towards Cagliari, until exit Bosa / Macomer, about 62 km. From Olbia, however, take SS 131 DCN towards Nuoro and Sassari and follow it for about 102 miles, to the exit Macomer, hence SS 129 for about 36 km and SS 129 bis for other about 3.5, and follow the directions. Having reached the town, we head to the interesting archaeological site of Tamuli, which is located about 6 km on the road Macomer - Santulussurgiu. Dolmen Su Edrosu is the oldest structure in the archaeological complex and, initially, it was mistaken for a Giant tomb in poor condition. The burial (length 8 m) is oriented SE; it holds the burial chamber (length 2.20 m, width 1.75 m), barely legible on the bottom; it is flanked by two blocks of trachyte, with vertical rows and the header plate (length 1.35 m, width 1.05, height 0.41). The rest of the archaeological complex of Tamuli is dated Nuraghic Age (Bronze Age) as it includes two Giant tombs, one dolmen and a nuragic village. It was built later than the dolmen age. The first Giants Tomb has an elongated body and apse, including a burial chamber and a large semicircular frontal exedra. The body of the tomb is oriented SE (length 14.40 m, width 7.32 m / 7.10); the semicircular exedra (14.60 m rope; arrow 7.10 m) has a seat around the perimeter, formed by 27 blocks, 14 in the left wing and 13 in the right one. At the center of the exedra, the entrance to the burial chamber is given by a trapezoidal perforated plate door over a raised threshold. The interest of this megalithic burial is given by the fact that, on its south side, they are arranged six (astronomically?) aligned three rocks worked in a conical shape, named "betili". Each the three largest (height 1.24 m / 1.40) ones show two mammillary drafts, and they have been identified as female gender. The other three, smooth, masculine ones. Next to the cult of dead, then, the prehistoric Sardinians - probably - also practiced fertility rites related to male and female gender. The second Giant Tomb, also willing to S / E, is currently invaded by the collapse and the earth, but it is possible to identify the profile of its body and apsidal exedra. The body tomb (length 11.40 m) encloses the funeral hall (length 8.20 m, width 0.85 m) and retains the entry threshold (length 1.20 m, width 1.54 m), raised by 0.10 m from the plane floor and a slab on the south wall. Hemicycle exedra (width 14.50 m) are some flat and polished stones that were part of the inside floor of the burial chamber. At short distance from the Giant tombs, on a rocky outcrop, it stands one nuraghe, complex typed, which consists in a tower and a bastion bilobed built. At short distance from nuraghe it extends the nuragic village, and nearby it was reported a nuragic source. Ticket: € 2 (adults), € 1 (reduced). Start from Macomer, and after 3.5 km path for the SS 129 bis, resumes SS 131 in direction Sassari. After 30 kilometers, about, exit at Mores-Ozieri-Olbia, along SS 128 bis across about five miles, than you can reach Mores. From Mores, take Highway 128 direction Ozieri to bend almost immediately right into provincial Bono, after about three miles, cross Rio Mannu: immediately after the bridge turn right and take a dirt road across 700 meters, until you see on the left the iron gate that leads into a farm. Leave the car and go through the gate, climb for about 350 meters to the fold, and from there you can go down a path that winds to the left under a rock bridge after 7-800 meters, at a bend, suddenly it appears Dolmen Sa Coveccada, isolated in the plain. 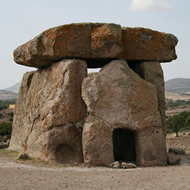 Sa Coveccada is the most impressive example of dolmen in Sardinia and is also exceptional in the Mediterranean: 2.70 meters high, it consists of three large sheets, about 5 feet long, supporting a fourth, table cover, scale unmatched in Sardinia: 6 feet long, 3 wide, 60 cm thick, and weighs about 27 tons. The dating of the structure is generally referred about 2500 BC (beginning of the Copper Age). The monumental rocks of gray - pink trachyte, are accurately machined and hammered. At the left of the closing plate there is a small niche, whose function has not emerged with certainty. Another element of great interest it is the circular opening, at ground level, in the front screen. 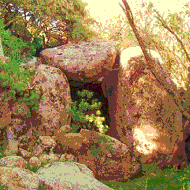 This characteristic makes Sa Coveccada as a unique case in the Sardinian dolmens and it clearly foreshadows the similar front openings of the later Giant Tombs (Bronze Age). This astronomical solstice target, however, appears isolated, in a context where the star target seems more applicable to the alignment of Sardinian and European dolmens. 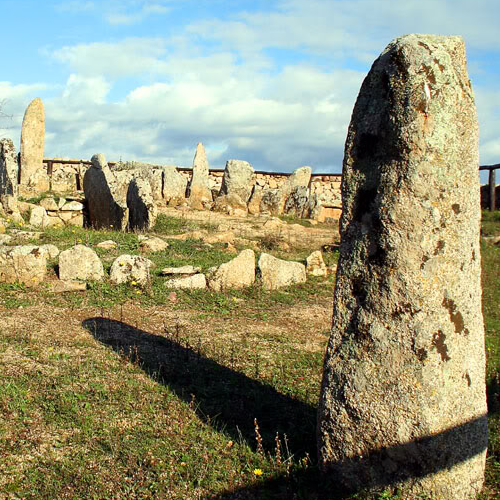 As the overall series of the European and Mediterranean megalithic structures show that the star target is earlier than the lunar and solar one; so it is reasonable to assume, for Dolmen Sa Coveccada, a more recent date than the commonly assumed one by scholars (2,500 BC). This hypothesis - in our opinion - would be supported by the gigantism of the structure and through the circular opening on the front screen, similar to the later Giant Tombs. Our hypothesis, therefore, would place this dolmen on the Early Bronze Age (about 1800 BC). Near Sa Coveccada it is a standing stone (an elongated vertically stone standing in the ground) broken into two sections, relating to an astronomical alignment, no longer traceable. Back in Mores, take SS 128 in the direction of Ozieri, through one of the most fascinating nature trails of northern Sardinia, about 17 km. 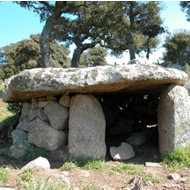 At Ozieri is located Dolmen Montju Corona (see photo). 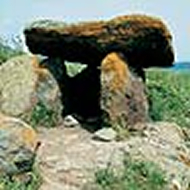 This is a dolmen with a rectangular plan with a 9.80 meters long tunnel. Edoardo Proverbio and Pino Calledda have measured its orientation identifying an azimuth of 64.6° and a declination of 18.91°, which could match a lunar astronomical target (the lower Southern lunistice). Reaching Benetutti; follow the path that runs along two sides of the cemetery. Approximatively 2 km on the left there is the bottom entrance gate of the ground called Maone. After passing a steep hill toward south-east, go to a farmhouse. The dolmen is located on the right, behind the dry stone wall. This monument is particularly interesting because it is a hybrid between two different systems of burial. You can define a mixed dolmen. It consists of part of a cave carved into a natural rock, like a Domus de Janas, covered by a single slab and completed on the sides and raised in masonry. The monument (length 3.5 m, width 1.3 m) includes a little trapezoidal leaf (width 0.65/1.20 m.; length 0.87 m.) oriented South, and a rectangular room (width 1.30 m.; length 1.75 m.; height 1.90 m) now filled with earth. From Benetutti take again SS128 towards Bitti and then take SS 389dir turning left direction Buddusò. Not far from the town, at Abialzos, near the rural churches of Santa Caterina and Sant'Andrea (well marked by signs), there are two dolmens. 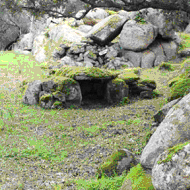 In particular, near the church of Santa Caterina, we can observe a simple dolmen surrounded by large granite boulders. The right wall is formed by two irregular boulders fixture in the ground as a knife. The covering slab has a pentagonal shape and it is resting on all three sides. Always at Abialzos, there is a third dolmen (Dolmen Abialzos); Proverbio and Calledda have defined it "allée couverte" (see photo). The two researchers have measured its orientation detecting an azimuth 53.8° and a declination 24.41°, corresponding, with a good approximation, at sunrise, dawn of the summer solstice. Returning to the village of Berchidda, continue along the road that leads to lake Coghinas and after about three miles, turn right to Monte Acuto. At the end of the road, leave the car and go up to walk in the direction of the peak, about 200 meters there is the dolmen of Monte Acuto, recently discovered and fully excavated. Its rather rare characteristic concerns that its plates are supported by the natural rock, using it for static purposes. The monument is part of a vast archaeological area which occupies the slopes of the mountain, consisting of numerous rock shelters and traces of other structures still under investigation. From the summit of the mountain, at which they stand the ruins of an ancient Judicial castle, you can enjoy a magnificent view both to the north towards the nearby massif Limbara both in the south to the lake Coghinas and the plain of Ozieri. Return to the junction to Berchidda and turn right into the lake Coghinas, reaching a few kilometers west state highway 392: then turn right to Tempio; there take SS 127 towards Calangianus, then turn left to Luras. About five miles before this town, ie immediately before km n. 44, on the left, take a dirty road through a cork; after a couple of miles, there is the locality called Su Laccu, where is located the dolmen same name. The monument consists of two slabs laterally fixed, that exploit the parent rock outcropping in the support plane; the left one it measures 0.90 m. height and 2.45 m. length; the right one it measures 0.95 x 1.55 m. Due to the difference in height, slab roof is slightly tilted and measure 2.30 m. length and 1.10 m. wide. The target star, discovered by Proverbio and Calledda, it corresponds to an azimuth 172.5°, with declination - 45.37°, in the direction occupied by Alpha Muscae in 2400 BC or by Alpha Crucis in 1300 BC. We may give credit to the first hypothesis of orientation, which would date the structure of the full Copper Age. There is a guided tour in a route that includes the Domus de Janas, the Giant Tomb and the Museum of Contemporary Art. Continuing to the public road, after about a mile, you arrive in the village Monimentos. 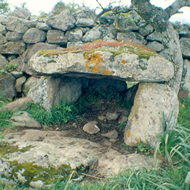 Clearly visible on the ground level, at a distance of about 30 meters, on a hill to the left of the dirt road, there is a second dolmen, called Sos Monimentos. It is an area of dense attendance of prehistoric (probable remains of a necropolis, one menhir, other structures of uncertain definition) in a particularly attractive and well preserved environment. 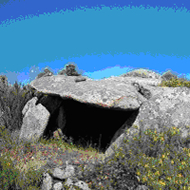 Sos Monimentos is a circular dolmen, with a chamber measuring m. 1.80 x 1.00, surrounded by a granite stone wall. At the entrance of the structure there are two rectangular shape plates about m. 0.60 high. On these plates rests an approximately circular covering, m. 2.50 x 2.25 wide. It has not been detected its possible astronomical orientation. At about seventy meters you can see the source of the River Tirso. Retrace the dirt road up to resume the local SS 389. Not far away, and exactly at km. 45.500 you should take a side road that leads to the paved edge of the forest compendium of Orunita. Within the grove is located Dolmen same name, whose target (azimuth 285°; declination 13.71°) is facing Beta Andromeda in 2650 BC; 'therefore it's older than previous Su Laccu, and we can date it to the last centuries of the Neolithic Age. 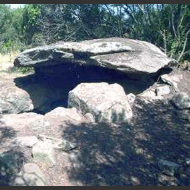 It should be recalled, near Buddusò, the site of Elcomis, where there is another dolmen (self-titled), consisting of some stones stuck in the ground, and supporting a slab 3 x 2 m., surrounded by an elliptical fence stone. Dolmen Elcomis seems built about three centuries later Su Laccu, as its orientation (azimuth 161.9°; declination - 46.75°) point toward star Alpha Muscae, too, but in 2100 BC. Both dolmen, simplest built than Sa Coveccada, are probably earlier than it, but with the same astronomical cult. We follow now SS 389 toward Buddusò, then SS 389 until Pattada, than the road Pattada north direction, along the long course of Oschiri Rio Mannu until SS 199 near Oschiri: on the right and after a few kilometers, turn right again at Berchidda junction . Luras, Province of Olbia/ Tempio, is the best represented town in the island. 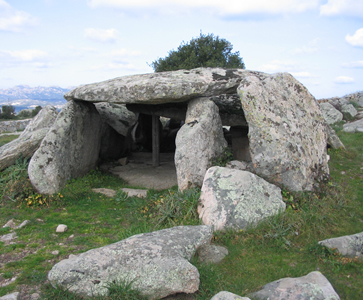 with four examples of dolmens (Ladas, Alzoledda, Ciuledda and Billella) out of 215 identified to date (Cicilioni, 2009). Dolmen Alzoleddha and Bilella are located near the sports field, Ciuleddha and Ladas, along the road towards Luogosanto. Follow, however, the signs. 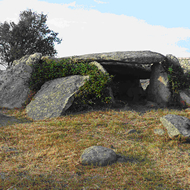 The inhabitants of Luras used to call these dolmens: "Sepulturas de zigantes or de paladinos"; they was constructed for collective burials and as a place dedicated to the worship, since fourth millennium B.C. These monuments, all dated in the late Neolithic period (3500 - 2700 BC), are comparable to the specimens of Corsica, above all, Menorca and Basque, Catalan and French regions. Dolmen Ladas is approximately dated 3000 BC, as some fragments of pottery with no special decorations discovered belove it; it is the most imposing prehistoric structure in Luras, for its grandeur and scope. 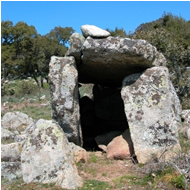 According to some scholars, however, the largest dolmens of Luras would not be dated at the Neolithic, but at the Ancient Bronze Age (1800 - 1600 BC), on the threshold of Nuraghic period. It consists of a large covered gallery which measures 6 meters length and 2.20 m. height, covered by two large slabs and equipped with an apse rear. The cell is divided in two parts by a transverse slab. The capstone rear - the second largest example in the Mediterranean - is enormous: it has an area of about 15 square meters and its sides measure m. 4.80 X 3.42, with a thickness of 45 cm. It was apparently machined and polished at the bottom. The input is one meter high, and m. 2.30 wide. The walls are formed by orthostatic (upright) and fairly regular plates, flanked by some flat rocks arranged in an oblique position. Source: Proverbio & Calledda, Rivista Italiana di archeoastronomia, Rome 2004. As mentioned above, based on the discovery of some fragments of pottery with no special decorations, Dolmen Ladas has been approximately dated on 3000 BC, also taking into account its most advanced construction technique, compared to the other examples in Luras, dating back to 3500 BC. These characteristics have led some scholars to date it on the ancient Bronze Age (1800 - 1600 BC). 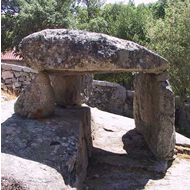 Its astronomical target is according to most of Corsican dolmen structures, oriented towards Centaurus/Crux/Musca system. In particular, the entrance of dolmen Ladas is oriented towards Alpha Muscae (the brightest star in the constellation of Musca, the lower unit of the whole system above) in 2800 BC. This confirms its assignment at the time of the final Ozieri culture (Recent Neolithic). The bottom of Centaurus/Crux /Musca system, that is the constellations of Crux (South) and Musca, are no longer visible in the northern hemisphere since three thousand years. To match it to a most recently stellar target, we should reach the Medium Bronze, and, in particular about 1400 BC when the input of the dolmen was oriented towards Alpha Crucis. This timing, anyway, it seems too recent for the supporters of the late dating. Dolmen Ciuleddha plant has a semicircular shape. It was builded in a construction technique similar to Ladas, but in a reduced scale. It has a semicircular burial chamber and the entrance facing south-east; the top plate measuring m.3.42 X 2.35; the total height of the monument is about 90 cm. In dolmen Ciuledda, as in Ladas, there were found some fragments of pottery, without special decorations, which allow approximate dated on the third millennium BC. Source: Proverbio, Calledda, Rivista Italiana di archeoastronomia, Roma 2004. Dolmen Ciuledda, based on the discovery of some fragments of pottery with no special decorations, was approximately dated to the third millennium BC His astronomical target is more accurate and can be reported to the star Rigel in 3100 BC, the previous millennium, that is, to that of the general dating given by archaeologists. Ciuledda, therefore, has been produced at least three centuries before Ladas, as shown by the technique less refined than the more majestic dolmens in Luras. Rigel is the brightest star in the constellation of Orion and, in prehistoric times it played a particularly dense meaning of religious references to the megalithic people. 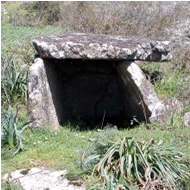 The small Dolmen Alzoledda is a simple type gravestone, rectangularly shaped with the entrance facing east and a trapezoidal room. It's generally referred to the Ozieri Civilization (3500-2700 BC.). The side walls are both composed of an orthostatic plate surmounted by some stones of reinforcement, while the bottom wall is formed by a single orthostatic quadrangular plate that protrudes from the walls almost half a meter. It is 2.65 m length, 2.20 m width and 1.65 m. height. Dolmen Alzoledda is generically referring to the civilization of Ozieri (3500-2700 BC.). At that time, in direction of the entrance of the structure, particularly around 2825 BC, it stood Alpha Crucis, which is the brightest star in the Southern Cross (which, as mentioned, is no longer visible in the northern hemisphere from about three thousand years). Four hundred years later, in the same direction, stood Rigil Kent, which is the brightest star in the constellation Centaurus, but this date it seems too recent. 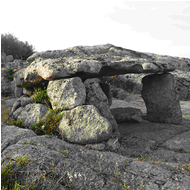 Dolmen Bilella is generically referred to Ozieri Civilization (3500-2700 BC. ), too. It has a rectangular plan and an entrance facing north-east. The right wall is constituted by an orthostatic rectangular slab; the left one by two partially processed boulders, resting on the natural rock. One of these rocks has been artificially adapted on the insertion of the coverage slab, flattened in its upper left natural surface. 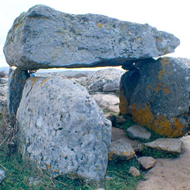 For this feature it is an unusual and almost unparalleled dolmen; it is 2.50 m. length, 1.40 m. width and 0.80 m. height. Dolmen Bilella has an unknown astronomical target, facing north-northwest. It is opposite to almost 85% of dolmens examined by Proverbio and Calledda, which are oriented towards south and southeast. This feature would suggest that, rather than toward the rising of a star, or a stellar group, it is facing the sunset. The data we have about the position of the constellations in prehistoric times, do not allow us, however, to give an objective response. His property may also be facing some additional natural or artificial object, but this hypothesis remains to be demonstrated. To reach the location of Li Muri, near Arzachena, let Luras taking the road that leads to the junction with SS 133: here turn right in the direction of Palau and reach Bassacutena, after passing the junction for Luogosanto; here turn to Arzachena. Along this road, after about seven kilometers, turn off right to the site of Li Muri. 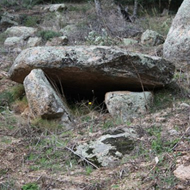 This particular prehistoric burial type concentration in the sites of Arzachena and a few other contiguous has led some archaeologists to identify a specific "Culture of Arzachena" that characterizes the Copper Age in northern Sardinia. 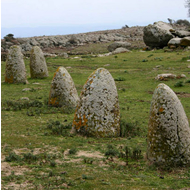 Near Arzachena, in fact, we have been found fifty circles tombs, which have a diameter ranging from 5 to 8.7 m. 75% of them are oriented to the south. The necropolis of Li Muri is the most interesting example of that type of funerary structures in the shape of cassette without opening formed by slabs of stone stuck in the ground. The necropolis consists of five "dolmen cysts" each of which is surrounded by a "ring" of large stones arranged in concentric circles, which should safeguard by leaching the mound that covered. The circles outermost are contiguous to each other. Between the tombs there are three small rectangular enclosures and parts of tombstones interpreted as elements of the funeral ritual. Outside of the complex stands one isolated menhir with three concavities. 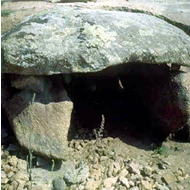 In July 2000, the writer has identified other three menhirs within the complex; two are both aligned with a side plate of one of the graves in the direction south, and the other side plate of the same tomb is aligned toward a third menhir, still heading south. The most exterior of the first two menhir is also aligned with the lateral slabs of two other tombs in the west. Proverbio and Calledda have also calculated the astronomical orientation of the four more conserved dolmen cysts, but these data do not allow us to identify a particular target. Despite the narrowness of their proportions, the "circles" of Arzachena found evidence in the Anglo-Saxon circular mounds of the Neolithic age (see Windmill Hill, UK) and may have similar stellar orientation. Within some graves they were found some funerary objects, now exhibited at the Museum Sanna in Sassari and at the Archaeological Museum in Cagliari; worth mentioning, among others, a cup of steatite with handles in the spool (like "Diana"), some necklaces vague shell and some apples hollow spheroids, still in steatite, originally mounted on sticks and perhaps used as weapons, or perhaps as insignia of command. There is a service of guided tours. From here you can reach in a few minutes Arzachena and then Palau, for shipment to Porto Vecchio, and continue the path of the dolmen of Southern Corsica. Who has a car, however, will be forced to head to Santa Teresa di Gallura and from there, take the ferry to Bonifacio, therefore, must go to Porto Vecchio.